Luke Ubelhor, on the right in picture, is the driver and co-owner of the stick shift 2009 Drag Pak Challenger. 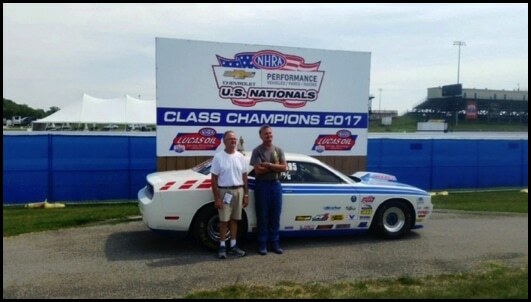 Luke won his stock class division at Indianapolis Raceway Park on August 31, 2017. Zach Ubelhor, on the left, is the mechanic, co-owner and husband of Brenda Ubelhor in Human Resources/Data Entry. Since they have started racing with this car in 2011, they have received their second Wally!